This is our Beast Face. Like most of our pieces, this prosthetic appliance was made to fit most faces. The main picture above is the hot foam latex version applied and painted in beige tones. This is a beast! Originally made for a production of Beauty & The Beast. It has a large nose and covers the cheekbones. The jaw has attached teeth to leave the actor's mouth free for signing. For theatrical productions, we recommend hot foam latex for the main beast and slush cast latex for the beast's double. Paint it in beige, tan or brown, or try it in blue for The Beast from X-men. It is in two pieces and comes unpainted by default. Custom painting can be added to this face. 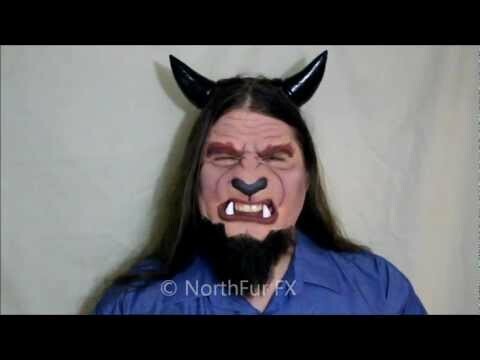 Contact lenses, ears and other prosthetic pieces other than the Beast Face that are shown are not included. Using these types of costume accessories can help accentuate this prosthetic piece's fierce features.